The stylish bar à vin at Verjus. Photo courtesy of Verjus. 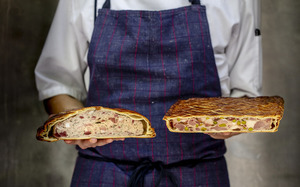 Some of the stunning pâtés en croûte at Verjus. Photo: Kelly Puleio. 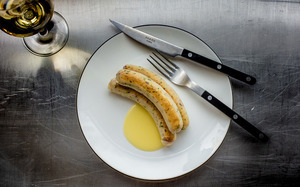 Boudin blanc à la mer. Photo: Kelly Puleio. Now open in Jackson Square is ~VERJUS~ from Michael and Lindsay Tusk of Quince and Cotogna, and new managing partner Matt Cirne. It’s a French-inspired cave à manger (which means “eat in a cellar”), which includes a wine bar, wine shop, and conserva bar, with vintage housewares and more that you can purchase in a retail shop. It’s the most casual of their ventures to date: no reservations, and you even order at a counter. 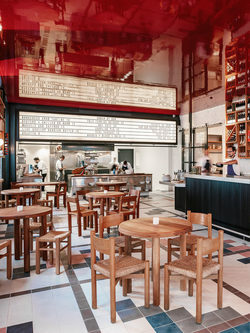 It should feel like a pintxos bar of San Sebastián, or a cicchetteria in Venice, where you can drop in for a bite and glass or two, and maybe grab a bottle to bring home. The wine selection will highlight small-scale, independent, organic wines, natural wines, and wines with a strong sense of terroir, along with Champagne, wines from overlooked terroirs, and more. The all-day (and daily changing) menu from chef Michael Tusk and chef de cuisine David Meyer (The French Laundry, The Progress, and In Situ) will lean on French charcuterie such as pâtés en croûte, rillettes, and terrines, along with boudin blanc or noir, duck confit, Dungeness carb tartine, and a daily omelette with seasonal produce from Fresh Run Farm in Bolinas. The selection of tinned fish and shellfish in the conserva bar will be available to eat with bread, lemon, olive oil, salsa verde, and pimentón. The historic space dates back to the 1850s, when it was the Eclipse Champagne Building, and Verjus occupies two formerly separate and now connected spaces at 528 and 550 Washington Street, flanking Hotaling Place Alley. The stylish design is inspired by France in the 1950s-1960s, with mid-century modern Luigi Caccia Dominioni and Gino Sarfatti light fixtures, and Pierre Chapo vintage tables and chairs, all under a lacquered burgundy ceiling, and the music is a soundtrack of yé-yé pop, jazz, and more. The bar à vin is open Mon-Thu 4:30pm-10pm, Fri-Sat 4:30pm-late (12am), while the shop (la cave) is open Mon-Thu 11:30am-7:30pm, and Fri-Sat 11am-7:30pm. Lunch is coming soon. 528 Washington St. at Hotaling. Winner winner chicken dinner. The spread at RT Rotisserie. Photo: Kassie Borreson. 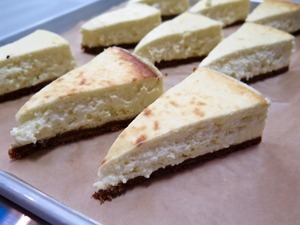 Vive La Tarte’s incredibly delicious “California” cheesecake. Photo: © tablehopper.com. 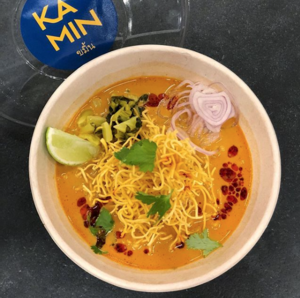 Khao soi with chicken or tofu at the new Kamin at SFO from Kin Khao. Instagram photo by @kamin_SFO. There was a rumor swirling around the Western Addition and Nopa that Rich Table’s ~RT ROTISSERIE~ was opening a second location in the former Delessio Market & Bakery space (next to Falletti Foods and Nopalito) and whaddya know, it’s true! Evan and Sarah Rich, along with business partner Jonny Gilbert, will be opening another RT Rotisserie at the corner of Broderick and Oak, which means the neighborhood will have access to their awesome rotisserie chicken, roasted cauliflower, sandwiches, salads, sides, and fab chicken soup! It’s going to be a bit bigger than the original Hayes Valley location, clocking in at 2,000 square feet, compared to 1,200 square feet, and outdoor seating will be available. Timing is unconfirmed at the moment, but they’re targeting spring. They’ll be delivering via Caviar upon opening, so folks further west will have easy access to delivery. 306 Broderick St. at Oak. A quick note: in the meantime, ~NOPALITO~ has been popping up in the Delessio space while they remodel and upgrade a bit for the next week or so. A third location of ~VIVE LA TARTE~ opens this Saturday January 26th in Noe Valley in the former Bliss Bar space (they designed the space in collaboration with Kilomade Studios and Planart). The Belgian-inspired bakery and restaurant from Arnaud Goethals and Julie Vandersmeech will not only offer their fab baked goods (their croissants are very popular, and I’m obsessed with their cheesecake, lawdy), but they are also offering brunch, lunch, and dinner service, and understanding the needs of the neighborhood, they developed a dedicated kids’ menu as well. Everything from kombucha cocktails to natural wine to espresso service from Sightglass will be on offer. Bonus: they’re partnering with Caviar for fast delivery. Flour will be milled in-house in a dedicated milling lab, and bread will be baked on-site, so the neighborhood will be smelling extra-good. Hours will be 7am-10pm daily. 4026 24th St. at Noe. Big news over at SFO: if you’re flying international, you can visit the new The Manufactory Food Hall, with three restaurants by Elisabeth Prueitt and Chad Robertson of Tartine, Gabriela Cámara of Cala, and Pim Techamuanvivit of Kin Khao. You can view the initial menu here (scroll through to see it). Tartine is offering three sandwiches, as well as a bakery counter (yes, there are morning buns!) and Coffee Manufactory has a full coffee bar, grab-and-go coffee, espresso drinks, and whole beans. Techamuanvivit is offering a fine-casual menu at Kamin by Kin Khao, with Kin Khao wings, a fried chicken sandwich, gluten-free fried chicken or a fried tofu box, and a couple noodle soups, all designed for portability. Cámara is pulling inspiration from her daytime Tacos Cala and is offering six kinds of tacos, from egg and potato to fish tacos. There is a full-service bar, grab-and-go options, and some retail too. International Terminal Boarding Area A near Gate A5 (post-security). Open 6am-12am daily, bar until 1am. More pizza: I’ve been looking at the Detroit-style pizza testing happening at ~CELLARMAKER HOUSE OF PIZZA~, and they are now open. This is a second location for the SoMa brewery (they took over the former Old Bus Tavern brewpub in Bernal). They’ll be offering more experimental beers on a four-barrel system, along with some guest beers. Open Wed-Mon 5pm-10pm. 3193 Mission St. at Valencia. 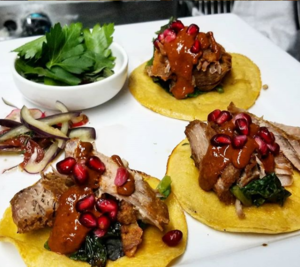 Sherry-braised pork shoulder “tortillas.” Photo: Daniel Azarkman. 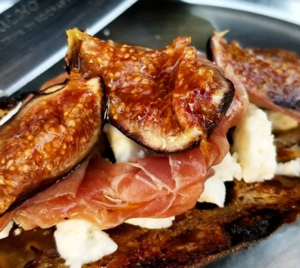 Summertime fig toast. Photo: Daniel Azarkman. A rendering of the upcoming El Lopo. Courtesy of El Lopo. Coming to Polk Street in the former location of The Pour House (which just closed over the weekend) is ~EL LOPO~, a Spanish-inspired, food-forward wine bar (through a California lens). 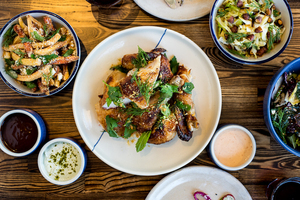 Owner Daniel Azarkman’s concept is inspired by pretending if California remained a Spanish colony, what would our food look like? So the wines will be focused on Spanish varieties grown in California, along with some Spanish vermouth (on tap), sherries, and wines, plus beers as well. The snacks will have some Spanish ingredients and inspiration, like a tortilla, but will change with the seasons—and don’t expect anything “authentic.” In fact, what he’s calling a tortilla is meant to bridge the gap between what the term means in Spain and what it means in Mexico: at El Lopo, they look and eat like Mexican tacos, but the flavors are much more Mediterranean, and the tortilla itself is made from potato and egg. During a test run pop-up at Blur, Azarkman served one with sherry-braised pork shoulder, wilted chicories, harissa, and pomegranate seeds. Some other past dishes included a Galician-inspired empanada of pork picadillo, yellow peaches, and sweet peppers, topped with romesco; fig and ham toast with mission figs, jamón serrano, and queso fresco on Jane fig and walnut bread; and roasted Mary’s chicken wings in a sauce of almond butter, saffron, and oloroso sherry. He’s working with the Butcher’s Local Union 510 on making custom Spanish charcuterie—they’re starting with a hard chorizo. There will also be canned seafood (like mussels and sardines) that will be served lightly embellished (think soft-boiled egg, greens, and bread), and he’s looking at featuring West Coast seafood, like herring from Oregon. Azarkman was most recently working with Off the Grid for six years, helping entrepreneurs launch their own food businesses that past three years, and was inspired to give it a go himself—he was also an intern for tablehopper some years ago, so it’s fun to see this happening. For now, El Lopo is planning to open around Friday February 1st as a bar with a very limited menu (think room temp items like canned seafood, salads, and charcuterie), and once some permits come through, the full food menu will launch. 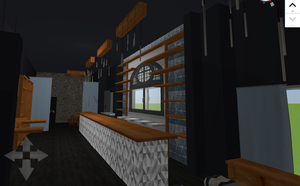 The rustic space will have 48 seats, with a long bar, and cooking will happen right behind the bar (Azarkman brought on a kitchen manager who has cooked at Octavia, Iyasare, and Octavia). Hours will be 4pm-12am, with the full menu running from 5pm-11pm when things are up and running. Follow along on Instagram for updates, and I’ll keep you posted on the full launch. 1327 Polk St. at Bush. Garlic sesame miso ramen from chef Dennis Lee. Photo courtesy of The Saratoga. Salt and vinegar onion rings with everything bagel ranch at City Beer Store. Instagram photo via @citybeerstore. Saison’s famed uni toast. Instagram photo via @saisonsf. Whatcha doing Wednesday evening? Chef Dennis Lee of Namu and Namu Gaji is popping up at ~THE SARATOGA~ and kicking off a four-week series of ramen specials. 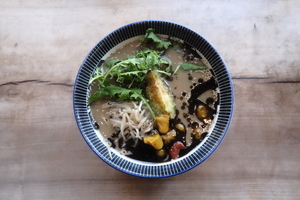 This Wednesday the 23rd, chef Lee is debuting his garlic sesame miso ramen, an exclusive dish available for just one night (crispy delicata squash, roasted tomato, bean sprouts, shiitake, mizuna, sesame mayu, nori, and onsen egg, $16). Then, The Saratoga’s chef Francisco Baca will be serving a different ramen special of his own creation each subsequent Wednesday (through February 13th). There’s plenty of Japanese whiskey to go with your bowl. No tickets or anything necessary, the ramen will be served in addition to the regular menu. After the closure of City Counter, I’ve been wondering where chef Sean Thomas was going to reappear, and it ends up he’s now at the new location of ~CITY BEER STORE~ in SoMa, which has launched its full-service kitchen. 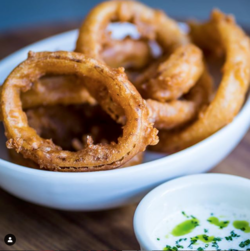 Lunch and dinner are served (12pm-10pm daily), check out the menu here, with dishes like salt and vinegar onion rings with everything bagel ranch, cider-steamed mussels with Chinese sausage, and Nashville Hot mochiko chicken on an Acme roll with yuzu kosho tahini. Perfect food to pair with their selection of craft beer, wine, and cider on draft. 1148 Mission St. at 7th St. 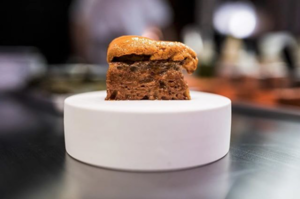 If you’ve always wanted to try ~SAISON~’s famed uni toast, and have been curious to try the food since chef Laurent Gras (L20) joined the team, but can’t afford the $298 tasting menu, they have officially announced a fixed bar menu for $148 for five courses, which also includes Millbrook Farms venison, which Gras air dries for a week, tempers in wagyu fat, and grills over embers. It’s seasoned with emulsified housemade butter and pink peppercorn, and served over a sauce of huckleberries, lemongrass, and black pepper with a garnish of beef tendon cracker, flower pollen, and spices, and a grilled avocado. You can also add dishes and supplements. A wine pairing is $98, while cocktails are $19, and there are other options, like beer to go with the uni, or a junmai sake to accompany the fish course of king salmon cured over sake lees. The bar seats six and you can reserve for one or two people. 178 Townsend St. at 3rd St.
~NICO~ has launched an à la carte menu in the dining room, although their tasting menu is an affordable $85 for six gorgeous courses if you have the time and money. And be sure to order a cocktail, they’re unique and some of the city’s most beautiful beverages. 710 Montgomery St. at Washington. Folks who live near the new ~LE MARAIS BAKERY~ in Lower Nob Hill will be happy to know they are now offering full breakfast, lunch, and brunch. Come by from 9am-3pm for scrambled eggs with smoked trout, salads, sandwiches, croques, and more. They’re also launching delivery on Caviar very soon! 1138 Sutter St. at Larkin. 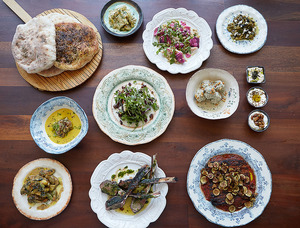 Some of the many dishes at Tawla. Photo: Smeeta Mahanti. I was so sorry to learn that after two years, the delicious and unique ~TAWLA~ on Valencia has closed. Like many unfortunate outcomes in life, the closure was due to numerous reasons; you can read owner Azhar Hashem’s piece on Medium about the closure. Thank you for all the beautiful meals. 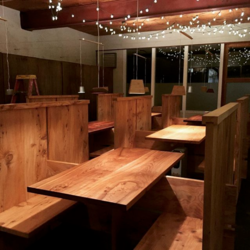 The new tables and booths at Soba Ichi in West Oakland. Instagram photo via @sobaichi_oakland. I was noticing some new tables on ~SOBA ICHI~’s Instagram feed, and it ends up they have some new hours to go with them! Dinner hours have launched, with a new menu of small plates, but now weekday lunch is no longer. The new hours are Wed-Thu 5pm-9pm, Fri 5pm-10pm, Sat 11am-2:30pm and 5pm-10pm, and Sun 11am-2:30pm and 5pm-9pm. Just don’t show up at the end of service and expect to find their prized noodles waiting for you—when they run out, that’s it! 2311A Magnolia Ave. at Grand, West Oakland.